UPDATED: Mon., July 23, 2018, 9:08 a.m. Though fire activity declined in the Spokane area Sunday after a fast-moving blaze swallowed about 100 acres of trees and grass near Valleyford starting late Saturday afternoon, weather forecasters predict temperatures this week rising to the mid 90s – prime conditions for more area blazes. The National Weather Service in Spokane predicted on Sunday that temperatures would peak at 93 or 94 degrees by Wednesday and again on Saturday. Sunday could hit triple digits, the weather service tweeted. Veronica Randall, an intel coordinator at the Department of Natural Resources’ Northeast Washington Interagency Communication Center, said increasing temperatures were a particular concern to fire efforts, especially with humidity hovering in the teens all week. Randall said that in southern Washington near the Oregon border, firefighters have noticed an increase in the rate of lightning strikes leading to ignition, which suggests there is more unburned fuel on the ground than in years past. But, she said, they don’t expect or predict any strikes in the area – at least not soon. “If we do get some lightning in this area, that’s concerning,” she said. A day after a plume of smoke rose south of Spokane Valley on Saturday, fire officials say the wildfire that sparked near Valleyford has been largely surrounded and is unlikely to grow in size. 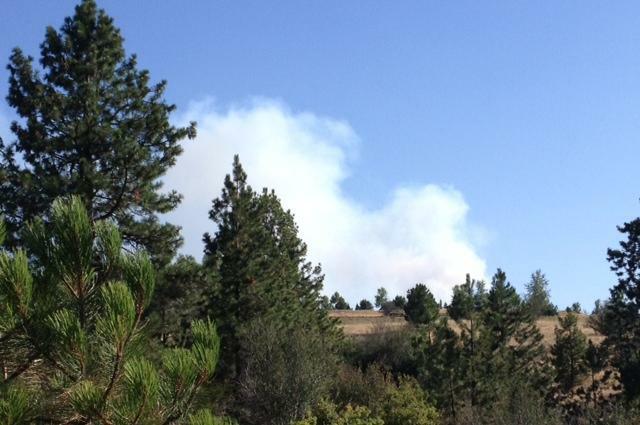 The so-called John Belmont fire, which started at about 5 p.m. near the Belmont Road area and grew to about 100 acres, forcing mandatory evacuations of multiple homes, has a fire line around 100 percent of it, said Eric Keller, incident spokesman. “It’s not likely to grow,” he said. Randall said crews were holding a strong bulldozer and retardant line. For the time being, however, containment remained around 65 percent. “(Crews) are focusing on clearing fuels inside the containment line today,” he said Sunday. All evacuations have been lifted, except for one house inside the line that was under Level 2 evacuation, meaning residents should be ready to leave at a moment’s notice. No structures have been lost and no injuries were reported by residents or firefighters. On Saturday night, state resources were brought in, including multiple aircraft that dropped water on the blaze. The Department of Natural Resources said those efforts were successful in controlling the fire and stopping it from spreading. Published: July 22, 2018, 11:52 a.m. Updated: July 23, 2018, 9:08 a.m.